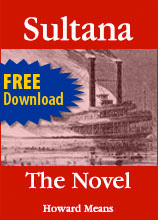 Early on April 27, 1865, the 260-foot wooden steamer Sultana exploded on the Mississippi about nine miles north of Memphis. On board were more than 2,000 Union troops. Of those, anywhere from 1,575 to 1,800 died, either from the trauma of the explosion (three of the four boilers went up at once), in the conflagration that followed on board, or by drowning in the cold and swollen river. No exact count of the dead could ever be made because no exact count of those who boarded the Sultana was ever recorded, but whatever figure one uses, only four battles of the Civil War claimed more Union lives: The Wilderness, Spotsylvania, Gettysburg, and Antietam. The explosion aboard the Sultana resulted in the greatest loss of life ever in U.S. waters and one of the greatest maritime losses in history, but that puts the tragedy in only partial perspective. More people died aboard the Sultana than died when the Lusitania was sunk off Ireland in 1915 by a German submarine. More fighting men died aboard her than died aboard the USS Arizona when it was attacked by Japanese aircraft on December 7, 1941. (Indeed, the entire assault on Pearl Harbor claimed only 400 or so more lives than were lost on the Sultana.) And, yes, more people died aboard the Sultana than died aboard the Titanic when it sunk in the North Atlantic, on April 14, 1912. The death toll, though, is only the beginning because the numbers can’t possibly convey the deep tragedy and irony of the loss. The Civil War had ended 18 days earlier when Robert E. Lee surrendered to Ulysses S. Grant at Appomattox Court House, Virginia. Most of those aboard the Sultana were Union soldiers, POWs newly released from the infamous Confederate prison camp at Andersonville in Georgia or from the lesser known Cahaba prison near Selma, Alabama. Having survived the twin hells of war and imprisonment, the men of the Sultana were headed home. By the early morning of April 27, 1865, they were almost there. This novel is my attempt to tell their story. Can’t wait to read one of my 2 favorite Uncles’ book — Sultana! Looking forward to Sultana and the rest of your work. I’m sure I’ll be pleased, my friend. A free book! That’s great Howie; thanks. Is there a Cliff’s Notes version? Howard, I got to know your writing with Johnny Appleseed and very much look forward to reading Sultana. Now have to figure out how to do the download…. Hello, Howard. Website is spectacular. I am just now catching up to it. I was going to write you concerning a building in Millwood, and Bill showed me the website and the story of Sultana. I had just read about that tragedy for the first time last week in the Washington Post and was thinking it would make a great historical novel! So nice job, can’t wait to read it. Thanks. I will send you a separate email on the house question.